OBJECTIVES: The aim of this study is to compare the role of Kabat rehabilitation and facial exercise techniques with nerve stimulation common in both for Bell's palsy treatment and its effectiveness in improving physical and social function. MATERIALS AND METHODS: A randomized control trial conducted at the Department of Physiotherapy, Mayo Hospital, Lahore. Two equal Groups (A and B) consist of 26 patients each. Patients were employed Kabat rehabilitation technique in GroupA and with facial exercise in Group-B. Patients in both treatment groups were followed until 3 weeks and improvement in Sunnybrook facial grading scale (SFGS) and facial disability index (FDI) scale were recorded at the end of treatment. RESULTS: In this study, 52 patients were enrolled into the study. At the end of 3 weeks, more improvement was seen in SFGS in Group-A (81.58 + 11.321) versus Group-B (63.77 + 21.645). Similarly, the improvement in physical and social function on FDI in Group-A was more than Group-B (>0.05). CONCLUSION: Kabat technique is more effective as compared to facial exercise technique in improving physical and social function. Two centuries ago in 1798 Nicolaus A Friedrich first described the term Bell's palsy. In 1821, Sir Charles Bell described it the first time. Bell's palsy is an acute condition which occurs due to damage of facial nerve along its course at the level distal to Pons. It is an idiopathic facial condition. The peak incidence of the disease was between age 25–50 years. A study showed that above age of 60 years occurrence of Bell's palsy was high in people having a history of diabetes and hypertension. Although Males and females are equally affected, the incidence in the females was higher during pregnancy. Bell's palsy results in facial muscles paralysis on the affected side of the face. The symptoms differ in every individual rages from mild-to-severe. Symptoms include voluntary loss of facial movements unilaterally and bilaterally in rare cases, resting asymmetry due to muscle weakness eyelid drooping, hyperacusis, painful auricle area, and taste changes. Thus, long-lasting Bell's palsy had a damaging effect on the individual physical and social lifestyle. Functionally, the ability of drinking, eating, and expressing oneself (verbally/nonverbally) can be greatly disturbed. The psychosocial impact of such a disorder can be life-altering. Bell's palsy is the most common cause of facial paralysis. Usually, the symptoms resolve completely; however, some patients continue to suffer for a longer period. Poor prognosis was seen in case of complete facial palsy, in case of symptoms not recovered by 3 weeks, people with >60 years of age, worst pain, herpes zoster virus, different disease conditions, for example, hypertension, diabetes, pregnancy, and in the case of severe degeneration of facial nerve which is shown by electrophysiological testing. Treatment option may include dose trial of anti-inflammatory, antibiotic, or antiviral agents and in severe cases, surgical decompressive procedures may be considered. In addition to this treatment option of Bell's palsy, physiotherapy has been reported to have a wide range of benefit in treating Bell's palsy., Physiotherapy maintained the facial muscle tone and stimulated neural transmission of facial nerve and thus beneficial for Bell's palsy patients. As bells' palsy is self-limiting, but even in this scenario, physical therapy techniques which emphasize on soft-tissue and muscle re-education should be applied to avoid muscle wasting or soft-tissue contracture formation. Sunnybrook facial grading scale (SFGS) was used to quantify the resting and voluntary muscles symmetry. The physical and social function of patients were assessed using facial disability index (FDI). The study focused on evaluating the resting and voluntary muscles symmetry and improving physical and social function before and after treatment. A randomized case-control trial was in 3 weeks. A total of 52 patients were included in this study aged of 25–50 years male and female, with Bell's palsy, having unilateral facial paralysis, with the nontraumatic onset and no other neurological deficit. Patients were divided into two groups randomly, each group contained 26 patients. 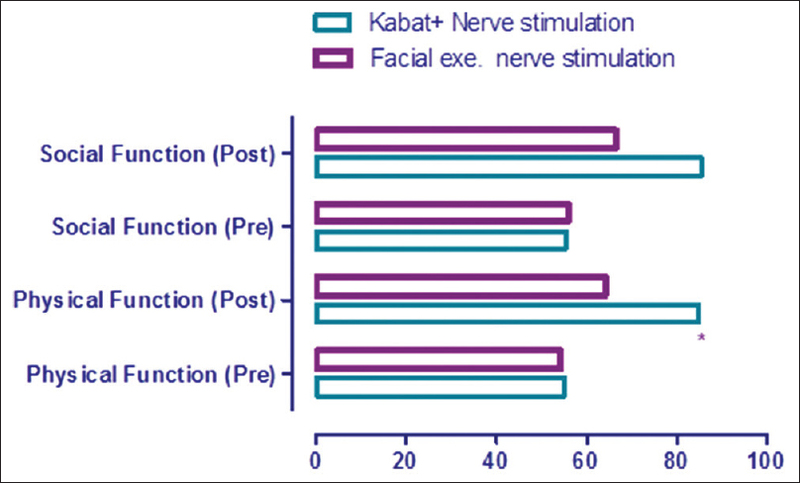 In Group A, patients were treated with Kabat rehabilitation technique along with nerve stimulation whereas in Group-B, Patients were treated with facial exercises technique along with nerve stimulation. After informed consent, all the patients were selected. Group A patients were treated with Kabat rehabilitation technique and nerve stimulation, for 3 weeks. Kabat rehabilitation mainly facilitates the voluntary feedback of a dysfunctional muscle through the global pattern of a muscle that undergoes resistance. After 3 weeks, resting and voluntary symmetry were recorded. In Group-B, patients were treated with facial exercise technique and nerve stimulation for 3 weeks. The patients were also reassessed after 3 weeks. The improvement in resting and voluntary symmetry was recorded by SFGS and FDI. SPSS 21 statistical software was used to analyze the data. Quantitative variables were presented as mean and SD while qualitative variables were presented with the percentages, frequency tables, and appropriate graphs. Association between qualitative data was found by independent sample t-test. Paired sample t-test was used to see improvement in SFGS and FDI in both groups. Value of P < 0.05 was considered as statistically significant. In Group A, the mean age of patients was 35.85 ± 8.46 years, and in Group-B, patients was 36.38 ± 8.34 years. Out of 26 patients in Group-A, 20 (76.92%) patients were female and 6 (23.08%) patients were male. In Group-B, 18 (69.23%) patients were female and 8 (30.77%) patients were male. It was detected that patients treated with Kabat technique, their resting symmetry, and symmetry of voluntary movements on SFGS were improved VS facial exercises technique [Figure 1]. At the 3rd week, the patients treated with Kabat technique their physical function on FDI was improved VS facial exercises technique. 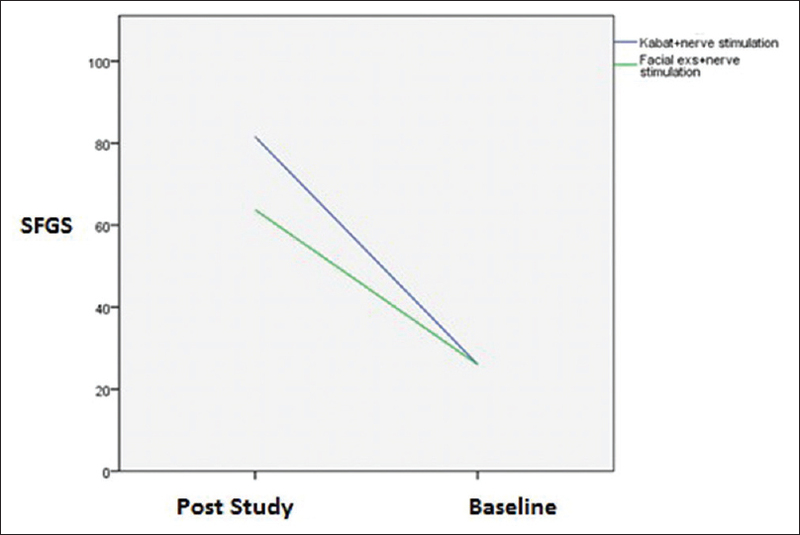 It was observed that patients treated with Kabat technique their social function and physical function on FDI was improved VS facial exercises technique after the study period [Figure 2]. Bell's palsy is an acute condition which occurs due to damage in the course of facial nerve at the level distal to the pons. It is an idiopathic facial condition. Treatment option may include dose trial of anti-inflammatory, antibiotic, or antiviral agents and in severe cases, surgical decompressive procedures may be considered. In addition, this treatment option of Bell's palsy, physiotherapy has been reported to have a wide range of benefit in treating Bell's palsy., The purpose of the current study was to compare the role of Kabat rehabilitation and facial exercise techniques in the treatment of Bell's palsy and its possible effect in improving physical and social function. In this research study, 52 patients were taken. In Group-A (n = 26), Kabat rehabilitation technique along with nerve stimulation was done on patients. In Group-B (n = 26), facial exercises were performed along with nerve stimulation. Patients were included randomly in these two groups using blind concealment method. Pretest measurements were taken before and after the intervention with the help of SFGS and FDI. Paired sample t-test shows significant improvement (P = 0.00) in both study groups. The comparison of SFGS scores and FDI scores for pretreatment and posttreatment also revealed significant improvement (P = 0.00) in treating Bell 's palsy and improving physical and social function in both study groups. The result shows both the treatment techniques, Kabat rehabilitation, and facial exercises were effective regarding treating Bell's palsy and increasing physical and social function as there was no significant difference between the two groups. Independent t-test is applied to compare two techniques. Pretreatment values for SFGS score and FDI varied insignificantly across the two treatment group with P > 0.05; however, by the end of the treatment sessions, there were significant differences between the two study groups with value of P < 0.05 and Thus, it shows that both techniques statistically significant; however, their mean difference shows that Kabat technique is clinically superior to facial exercise technique in treating Bell's palsy and improving physical and social function of patients. Thus, according to my research, it is concluded that nerve stimulation with Kabat techniques was found to be more effective than the nerve stimulation with facial exercises in patients with Bell's palsy and this is in agreement with the previous study. Barbara conducted a study on the effects of Kabat rehabilitation in patients affected by Bell's palsy, shows that the clinical outcomes of patients improved and they show better and faster recovery. A study was carried out on the effectiveness of neuro-proprioceptive facilitation on re-education facial muscles and functional problems in Bell's palsy. The results showed that recovery from facial paralysis could be difficult and long-lasting process and the utilization of a grading system may help the physical therapist. The effect of this type of therapy may help the patients if the therapist is well trained and familiar with the neuro-physiological background. A research was conducted to determine the effects of neuromuscular retraining in case of facial nerve paresis. This shows that it is an effective technique for optimal recovery due to paralysis. Facial neuromuscular retraining improves the facial muscular control using special movement training techniques is based on evidence and therapeutic practice. Retraining techniques enhanced outcomes and develop patient satisfaction by treating the condition in a programmed way. It focuses on improving range, flaccidity, prevents synkinesis, and improves facial motor control. Facial neuromuscular retraining technique using both sensory and motor feedback. It utilizes sensory feedback along with coordinated movement activities are done to facilitate and return the correct facial movement patterns, and all the undesired, unwanted, and abnormal facial expressions are inhibited. Clinical observation on exercise comprehensive therapy for treating Bell's palsy shows that: The exercise comprehensive therapy has significant effects in treating Bell's palsy. A reliable method of grading is needed like SFGS is a well-established tool for assessing facial movement outcomes. This tool provides a quantitative score for reporting purposes and thus easily administer and clinically relevant. It is very sensitive and specific and can detect clinically important change over time or with treatment. It uses five standard expressions to examine the different region of face separately. In 2007, Yeo and Lee suggested that 96% of Bell's palsy recovered spontaneously. In a study done by Lars Thomander and Erik Stalberg, their result showed that only in case of temporary conduction block the early improvement of the clinical and electrophysiological function by the use of many physical therapy techniques take place. Facial exercises are also helpful in improving facial functions and are also evident from many studies. The brain-to-nerve-to-muscle routine is recreated during facial exercises. The goal is to mentally focus on muscles actions while during voluntary movements. The emphasis on correct movements should be done. After practicing many times, these movements may finally become automatic and natural movements which we called as expressions by using the motor learning phenomenon. The exercises can be very beneficial; although, it is a slow process. Physiotherapy maintained the facial muscle tone and stimulated neural transmission of facial nerve and thus beneficial for Bell's palsy patients. Diels reported that in the early phase of Bell's palsy if one apply electrical stimulation to the facial muscles, then it causes interference in neural regeneration and slower the recovery and thus should be avoided in this phase. He believes but provides no evidence. However, Kidd, Tallis, and Targan contradict this report and believes that by applying electrical stimulation recovery is fast as it speeds up the regeneration process of the facial nerve. A randomized clinical trial was taken to determine the effectiveness of proprioceptive neuromuscular facilitation (PNF) technique, and neuromuscular re-education for reducing facial disability and prevent synkinesis in patients of Bell's palsy and the results show that both the techniques are statistically significant. Both the treatment groups showed improvements resting and voluntary muscles symmetry when they were assessed after 4 weeks follow-up. The results also showed that both the techniques are effective but in different domains as neuromuscular retraining technique when applied along with conventional PT is effective in preventing synkinesis; however, PNF technique when done with conventional PT is effective in reducing facial disability and improving facial functions. The study was conducted on determining the effectiveness of PNF training on the facial profile. We employed PNF, in which global stretching and resistance is applied one after the other to improve voluntary contraction of damaged muscles and then, its actions are enhanced by resistance applied through verbal input and manually, such as lifting upper lip and lowering lower lip move the tongue out, to adapt the perioral muscles to the new morphological circumstances. Although the training appeared to be effective as it improves facial profile by sharpening the mouth and submandibular region, the results showed that continued training is necessary to avoid relapse. Kabat rehabilitation technique along with nerve stimulation is more effective in treating Bell's palsy as compared to facial exercise technique along with nerve stimulation. SFGS and FDI scale showed higher improvement in patients who were treated with Kabat technique. However, both techniques showed significant improvement in both treatment groups. Newadkar UR, Chaudhari L, Khalekar YK. Facial palsy, a disorder belonging to influential neurological dynasty: Review of literature. N Am J Med Sci 2016;8:263-7. Goodrich JT, Kliot M. Chapter 1 - History of the Peripheral and Cranial Nerves A2 - Tubbs, R. Shane. In: Rizk E, Shoja MM, Loukas M, Barbaro N, Spinner RJ, editors. Nerves and Nerve Injuries. San Diego: Academic Press; 2015. p. 3-22. Keels MA, Long LM Jr., Vann WF Jr. Facial nerve paralysis: Report of two cases of Bell's palsy. Pediatr Dent 1987;9:58-63. Monini S, Lazzarino AI, Iacolucci C, Buffoni A, Barbara M. Epidemiology of Bell's palsy in an Italian health district: Incidence and case-control study. Acta Otorhinolaryngol Ital 2010;30:198. Savadi-Oskouei D, Abedi A, Sadeghi-Bazargani H. Independent role of hypertension in Bell's palsy: A case-control study. Eur Neurol 2008;60:253-7. Gillman GS, Schaitkin BM, May M, Klein SR. Bell's palsy in pregnancy: A study of recovery outcomes. Otolaryngol Head Neck Surg 2002;126:26-30. Cotton BA. Chiropractic care of a 47-year-old woman with chronic Bell's palsy: A case study. J Chiropr Med 2011;10:288-93. Brach JS, VanSwearingen JM, Lenert J, Johnson PC. Facial neuromuscular retraining for oral synkinesis. Plast Reconstr Surg 1997;99:1922-31. Brudny J, Hammerschlag PE, Cohen NL, Ransohoff J. Electromyographic rehabilitation of facial function and introduction of a facial paralysis grading scale for hypoglossal-facial nerve anastomosis. Laryngoscope 1988;98:405-10. Feldman EL, Cornblath DR, Porter J, Dworkin R, Scherer S; Attendees of the NIH Peripheral Neuropathy Conference, et al. National institute of neurological disorders and stroke (NINDS): Advances in understanding and treating neuropathy, 24-25 October 2006; Bethesda, Maryland. J Peripher Nerv Syst 2008;13:1-6. Neely JG, Cherian NG, Dickerson CB, Nedzelski JM. Sunnybrook facial grading system: Reliability and criteria for grading. Laryngoscope 2010;120:1038-45. VanSwearingen JM, Brach JS. The facial disability index: Reliability and validity of a disability assessment instrument for disorders of the facial neuromuscular system. Phys Ther 1996;76:1288-98. Alakram P, Puckree T. Effects of electrical stimulation on house-brackmann scores in early Bell's palsy. Physiother Theory Pract 2010;26:160-6. Pildal J, Hróbjartsson A, Jørgensen KJ, Hilden J, Altman DG, Gøtzsche PC, et al. Impact of allocation concealment on conclusions drawn from meta-analyses of randomized trials. Int J Epidemiol 2007;36:847-57. Barbara M, Antonini G, Vestri A, Volpini L, Monini S. Role of kabat physical rehabilitation in bell's palsy: A randomized trial. Acta Otolaryngol 2010;130:167-72. Sardaru D, Pendefunda L. Neuro-proprioceptive facilitation in the re-education of functional problems in facial paralysis. A practical approach. Rev Med Chir Soc Med Nat Iasi 2013;117:101-6. Vanswearingen J. Facial rehabilitation: A neuromuscular reeducation, patient-centered approach. Facial Plast Surg 2008;24:250-9. Hwang SW, Su JM, Jea A. Diagnosis and management of brain and spinal cord tumors in the neonate. Semin Fetal Neonatal Med 2012;17:202-6. Liu DR, Wang ZB. Clinical observation on exercise comprehensive therapy for treating peripheral facial paralysis. Modern Med Health 2011;12:11. Ross BG, Fradet G, Nedzelski JM. Development of a sensitive clinical facial grading system. Otolaryngol Head Neck Surg 1996;114:380-6. Tiemstra JD, Khatkhate N. Bell's palsy: Diagnosis and management. Am Fam Physician 2007;76:997-1002. Kar N, Banerjee SK. Prediction of recovery of Bell's palsy from clinical manifestations. J Indian Med Assoc 1992;90:267-9. Cohan CS, Kater SB. Suppression of neurite elongation and growth cone motility by electrical activity. Science 1986;232:1638-40.